Detours is designed and directed by Taien Ng-Chan, who also contributes two maps: City Transit, video-poems and stories about riding the bus and metro, and Streets of the Saints, a playful melding of geography, hagiography and poetry (with the help of Byzantine iconographer Adrian Gorea). Excerpts from Lance Blomgren's Walkups are mapped out to Gord Allen's sound explorations, finding stories and absurdities in the lives and dwellings of Montrealers. For City Ditties, Samuel Thulin creates mobile media music, using only sounds recorded on-site, and creating them on-site as well, on an iPhone. Emilie O'Brien's Field Notes invokes Maguire Meadows, aka Le champ des possibles, with embroidery, textworks, images, and an interview with the creator of the Roerich Garden project. 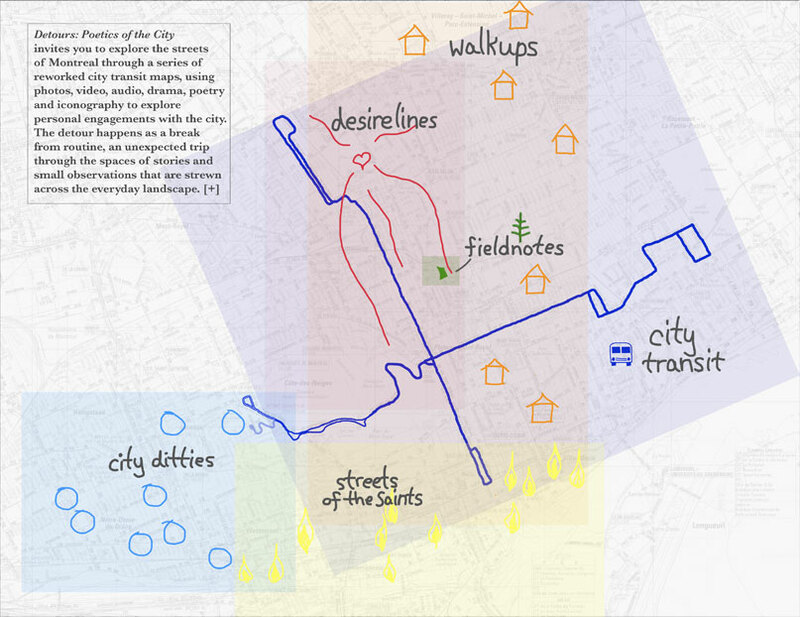 Donna Akrey maps the Desirelines that she encounters in her travels through the city – those paths made by people pursuing the shortest distance between two points. Finally, the map Rendez-vous was produced in collaboration with the participants of Accés Culture Montreal's "cultural mediation" workshops, as part of the 2012 Biennale internationale d'art numérique. The works presented here are optimally viewed or listened to in the places that inspired them, though they also beckon to the armchair tourist. Detours is meant to be a mobile media project, accessible through tablet computers and smart phones (headphones recommended).